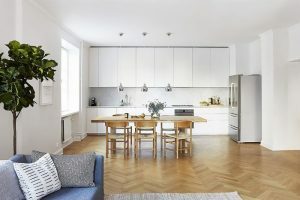 Summary: Hardwood flooring might be one of the more expensive options you have to choose from but there are several compelling reasons why it worth spending a little extra on. When most people think about making changes to their house they usually think of some of the bigger, more noticeable features. Adding an island counter to your kitchen, upgrading to a new refrigerator, or getting a new couch set will surely make the house look and feel nicer. One of the areas most homeowners tend to overlook, however, is the flooring. The flooring you have can really tie a room together or stick out like a sore thumb. There are some key reasons why hardwood flooring is worth every penny. No matter how hard you try, keeping dirt from coming in contact with your floor can be an uphill battle. How many times have you accidentally gotten dirt from your shoes on the floor? How about spilling food onto your seat cushions or carpet? Accidents happen, which is why it is smart to have a way to clean up. You can vacuum your carpet but you need to be careful about what kinds of cleaning products you put on it. If you are not careful you can easily end up staining your carpet. Hardwood flooring, on the other hand, is much more flexible. In addition to vacuuming, you can also mop and sweep wood flooring to remove stains and particles. Carpets might feel nice but they are notorious for trapping unwanted dust, dirt, pet fur, pollen, and other unwanted particles. These trapped particles can significantly reduce the air quality in the house, which can make it tougher for those with allergies to breathe. Unlike a cushion cover you might buy from a store like The Foam Factory, you cannot easily swap out a dirty carpet. Hardwood flooring will not trap particles, making it that much easier to keep the air quality inside as clean as possible.